One is a little diaper cake and the other one is made out of blankets. 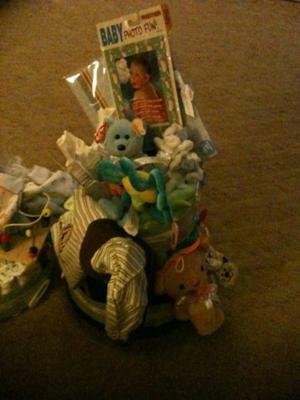 the bottem was made out of diapers and on top was filled with baby things. This one was made out of blankets and it also has cloths and other baby things on top. These dipaer cakes was a wonderful gift for a baby shower center piece..